If anyone has felt they’ve been sitting alone in the center of a world churning frantically around them, Ladytron has come back with the perfect album to tap into your mood. 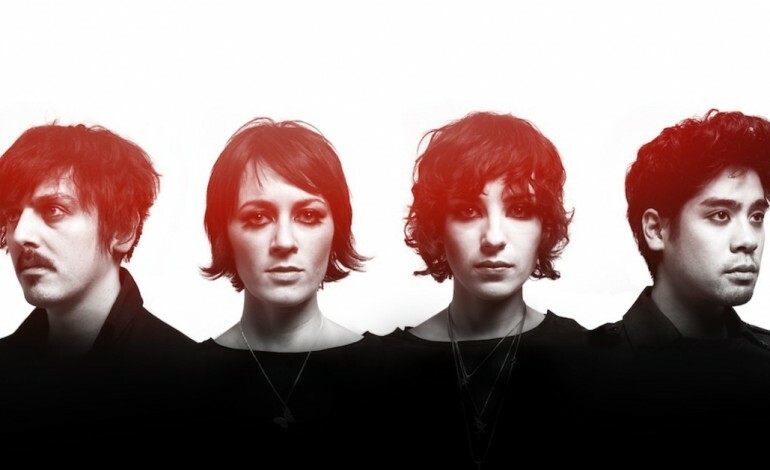 The self-titled Ladytron is the band’s first release since 2011’s Gravity the Seducer and provides what guitarist, synthesist and vocalist Daniel Hunt describes as a “snapshot” of the current times, based on personal experiences and reflections. Hailing from Liverpool, all four original members of the band came back together in 2016 after spreading out across the globe—Hunt in Sao Paolo, lead vocalist Helen Marnie in Glasgow, vocalist and synthesist Mira Aroyo in London and synthesist Reuben Wu in Chicago—to begin creating music again. They came to a somewhat more mature and darker sound than before; the opening lines of “The Animals,” the first single off of Ladytron (“There’s no law / There’s no God / There’s no harm / There’s no love”) contrasts with the airy “White Elephant” from Gravity the Seducer (“Surrender with me / We’re walking in our sleep”) but can promise the same haunting air and electropop that Ladytron delivers. mxdwn: What built up to the eight-year hiatus and how did it end? Daniel Hunt: We released five albums in 10 years from 2001 to 2011 with a lot of touring around the world in between. It was time for a break, but we did not expect it to last quite so long. Life took over as it does. We moved countries, continents, had families and so on. Finally, in 2016 we were all ready to begin working on a new album. The hardest part was keeping quiet about it for two years. mxdwn: This album addresses a global social unrest. Why did it feel important to say something? DH: It’s more simple than that; like anyone, we are influenced by our surroundings. The themes of the album are actually very personal, not about events or currents. But the disquiet of this moment is background noise that nobody is immune from and cannot help but be affected by. mxdwn: What has it been like working all together again? DH: Enjoyable, we have spent so long apart. It is easier to get back on-board than we imagined. mxdwn: How did you approach the creation of this album, this new chapter for Ladytron? DH: We planned to take a break after 2011’s Gravity the Seducer, but we envisaged it would be maybe a few years. In the end, it was June 2016 before we came together to begin making a new album when all of us were ready in both our personal and professional lives to do it. mxdwn: Have you found changes in the music scene after the years that you’ve had to contend with as a band? DH: As a group we have never paid much attention to what is happening outside. There have been changes for sure, but not ones that we feel particularly affected by. For example, technological changes—we’re natives to the way music is made and consumed today as the seeds of this were planted right around when we began. mxdwn: “The Animals” has some pretty intense opening lines — why was that the first song you decided to share? DH: It was the first song that was ready, but also we felt it was the correct one to release first. It sounds like Ladytron, it is also in many ways unlike anything we had done before, certainly lyrically. mxdwn: The three songs released from the album express some nihilistic views. Does the album go on to provide any messages of hope or comfort? DH: We consider the album hopeful. We are not nihilists. The imagery is there because it reflects the moment we are in, a reckoning with the present. That is also an escape route. mxdwn: Given the themes of the songs, would you say the album is a cathartic work, or a cautionary message to take action? DH: More a catharsis. We don’t consider it a comment on the times we are in, more a snapshot. In a sense, those themes are the landscape inside which we experienced the personal experiences which inspired the songs. mxdwn: How are you preparing to start the tour together again? Anywhere particular you’re excited to stop at? DH: Right now, we are in Mexico. We then go to California. Two places that were always good to us, and important at the very beginning, and a fitting place to start.